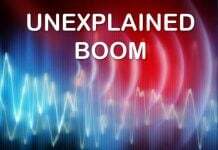 What is making these unexplained loud booms? 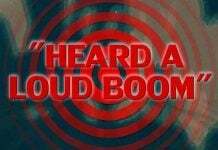 This is your guide to determine and discover the origin of mystery booms and rumblings. Read carefully! Residents in the vicinity of Lake Seneca in the Catskill Mountains of New York have long known booming sounds as “Seneca guns” (a term also common throughout the coastal region of the Carolinas). This name has been variously attributed to the section in Washington Irving’s short story “Rip Van Winkle” (1819) that describes the ghosts of Henry Hudson’s crew playing nine pins in the Catskill Mountains, or to the short story “The Lake Gun” by James Fenimore Cooper (1851). Elsewhere, such sounds are known by a variety of names including “mistpouffers” (fog belches) in coastal Belgium, “Bansal guns” in the Ganges delta and the Bay of Bengal, “brontidi” (thunder-like) in the Italian Apennines (Gold and Sorter 1979), and “yan” by the people of Harami in Shikoku, Japan. Determining the source of booming sounds becomes an exercise in the process of elimination beginning with a thorough search for common anthropogenic sources such as sonic booms, military exercises (of course the military can be reticent about some of its boom-producing exercises), construction or quarry blasting, fire, explosions, etc. Data from a local seismic network coupled with an array of acoustic infrasound sensors would quickly reveal whether the sounds were generated by local earthquakes (or in volcanic regions, explosive venting of a neighboring volcano). An acoustic array would provide information on the direction and spectral character of atmosphere-borne sounds from remote sources. Local geologic settings will of course narrow the possibilities. In the absence of evidence for earthquake-generated sounds, the challenge becomes correlating the occurrence of booming sounds with plausible sources such as regional thunder storms; large waves breaking well off shore driven by major, mid-ocean storms; explosive offshore methane bursts; meteors; or perhaps strong winds stimulating local sand dunes into a booming mode. Davidson (1938) compiled descriptions of ear-witness sounds accompanying small to moderate earthquakes in England from 1880 through 1916. Descriptions of the sounds in his catalog include the boom of distant cannons or distant blasting, loads of falling stones, the blow of a sea wave on shore, the roll of a muffled distant drum, an immense covey of partridges on the wing, and more. A significant number of ear-witness descriptions of earthquake sounds cite the sound as preceding the felt shaking from earthquake by several seconds. Indeed, on page 288 of Elementary Seismology, Richter (1958) recounts the experience of seismologist Pierre St. Amand in the recording vault at the University of Alaska, Fairbanks, during a series of earthquakes in 1947 when he noted that audible sounds coincided with the first (P-wave) arrivals while felt shaking began with the S-wave arrivals. Reports of low, rumbling sounds accompanying earthquakes heard and felt by U.S. Geological Survey (USGS) personnel installing seismic stations during the September 1975 Brawley swarm in the Imperial Valley, California, provided the opportunity to record both acoustic and seismic signals on the same time base (Hill et al. 1976). The results for three earthquakes with magnitudes ranging from M 2.0 to M 2.8 demonstrated that a 40–70-Hz acoustic signal began within 0.02 sec of the P-wave arrival at the station and gradually died out by the time the S-wave arrived some two seconds later—a result consistent with St. Amand’s observation in 1947. Calculation of the seismic-acoustic transmission coefficients confirmed that the seismic body waves from these earthquakes were capable of generating acoustic wave amplitudes within the threshold of human hearing in the 40–70-Hz frequency band. Sylvander et al. (2007) carried out a similar experiment and analysis for a series of small earthquakes (ML < 2.8) in the French Pyrenees in 2004 with similar results. Listen to the weird sound of the Japan earthquake in 2011. Whether small (M < 2.5), shallow earthquakes produce audible sounds and felt shaking depends on local site conditions including ambient noise levels. The experiments described above were carried out in the open air and away from cultural noise sources. Under such circumstances, it seems that the free surface acts as a giant woofer in response to the incident P-wave but remains below the threshold of felt shaking, while the slower S-wave produces perceptible shaking, at least for earthquakes in the M 2 .0 to 2 .8 range. It seems that even smaller earthquakes are capable of producing audible sounds with no perceptible shaking, i.e. during the 1989 Mammoth Mountain earthquake swarm, muffled booming sounds were heard but no shakings were felt. These earthquakes were shallow (< 4 km deep) with magnitudes M < 2.0. This may explain reports by people living on the flanks of restless volcanoes of ominous booming sounds that both feed local legends and serve as an early warning of a possible impending eruption. Rock bursts can be viewed as a class of small, near-surface earthquakes. 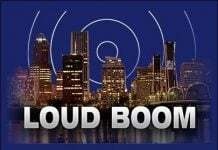 They are capable of producing locally loud, explosive reports. Most rock bursts are associated with mining and quarry operations as the confining pressure of overburden is removed leading to the spontaneous, explosive release of stress stored in long-buried rock. Spontaneous rock bursts occasionally occur at depths of a few hundred meters in sheeted granitic or metamorphic terrains exposed by the retreating Pleistocene ice sheets (Monroe and Wicander 1992). Bill Ellsworth and Bernard Chouet describe feeling a perceptible jolt and hearing sharp, booming sounds from rock bursts associated with the development of columnar jointing in the 30-m-thick cooling crust of Kilauea Iki lava lake on Kilauea Volcano, Hawaii (Chouet 1979). Chouet, B. (1979). Sources of seismic events in the cooling lava lake of Kilauea Iki, Hawaii. Journal of Geophysical Research 84, 2,315– 2,330. Davidson, C. (1938), Earthquake sounds, Bulletin of the Seismological Society of America, 28, 147−161. Hill, D. P., F. G. Fischer, K. M. Lahr, and J. M. Coakley (1976). Earthquake sounds generated by body-wave ground motion. Bulletin of the Seismological Society of America 66 (4), 1,159–1,172. Lawson, A. C. (1908). The California Earthquake of April 18, 1906: Report of the State Earthquake Investigation Commission VI. Part 2. Washington, DC: Carnegie Institution of Washington. Mallet, R. (1887). Great Neapolitan Earthquake of 1875: The First Principles of Observational Seismology. London: Royal Society of London, vol. 2, 87–294. Monroe, J. S., and R. Wicander (1992). Physical Geology: Exploring the Earth. St. Paul, MN: West Publishing, 639 pp. Richter, C. F. (1958). Elementary Seismology. San Francisco: W. H. Freeman, 768 pp. Sylvander, M., C. Ponsolles, S. Benahmed, and J.-F. Fels (2007). Seismoacoustic recordings of small earthquakes in the Pyrenees: Experimental results. Bulletin of the Seismological Society of America 97(1B), 294–304. While conducting on-site interviews during their investigation of the 2004 M 9.1 Sumatra earthquake and tsunami, George Plafker, Lloyd Cluff, and Stuart Nishenko documented multiple accounts by widespread witnesses of loud, offshore booming sounds accompanying the main phase of the tsunami. The number of reported booming sounds coincided closely with the two or three largest waves that impacted the coast at any given site. In follow-up interviews, Plafker learned that booming sounds are a familiar phenomenon among big-wave surfers during extreme waves, and that such sounds are also familiar to residents in the vicinity of Maverick’s in northern California, a world-famous site for big-wave surfing. Similar reports accompanied the 1896 and 1933 Sanriku M~8 earthquakes and tsunamis in Japan, both of which occurred at night (Shuto 1997). In a carefully researched novel, Wall of the Ocean, author Akira Yoshimura describes booming sounds accompanying the 1896 Sanriku tsunami: About the same time [as the earthquake] the villagers were still celebrating without paying too much attention to the sudden change in the sea condition, but all of a sudden they heard big booms from off shore. Some thought that they were rumblings of thunder, but others thought that they were the booms of cannons firing. Some apparently thought that Russian battleships started firing. An individual who heard the booms at about 8:20 p.m. watched off shore, and saw lantern-like fire balls moving gradually from off shore toward the beach. It was described that the booming sounds and fire balls were produced by huge walls of water. Yoshimura relates similar accounts of booms and lights witnessed during the 1933 earthquake and tsunami. This raises the possibility that the source of booming sounds heard in some coastal regions (e.g., the Seneca guns of the coastal Carolinas, the mistpouffers of coastal Belgium, or the Bansal guns around the Bay of Bengal) might be large waves generated by distant storms breaking well off shore (beyond barrier beaches or outer banks). The mechanisms and conditions under which big storm (or tsunami) waves generate booming sounds, however, remain unclear. One possibility is that the “fire balls” and booming sounds attending the 1896 Sanriku tsunami may be somehow related. Enomoto (1999) notes that of 17 large tsunamis documented in Japan from 684 to 1946, nine included descriptions of luminous phenomena. He suggests that, rather than bioluminescence excited by wave turbulence, this “tsunami lightning” may be associated with methane released from disrupted volumes of methane hydrate residing in offshore accretionary prisms. In any case, factors contributing to wave-generated booming sounds likely include the depth and local morphology of the sea floor, average inclination and stability of adjacent continental slopes, and, most importantly, the amplitudes and wave-lengths of the incoming waves. Shuto, N. (1997). A natural warning of tsunami arrival, in Perspectives on Tsunami Hazard Reduction, ed. G. Hebenstreit, 157–173. Dordrecht: Kluwer Academic Publishers. Submarine landslides on continental margins are also capable of disrupting gas hydrate beds, thereby releasing methane with the potential for explosive ignition at the ocean surface. Astrophysicist Tomas Gold, along with his colleague Stephen Sorter, proposed a more general explanation for natural explosive sounds (which they label “brontides” after the Italian “brontidi”) involving the explosive release of high-pressure methane from deep within the Earth (Gold and Sorter 1979). This proposal stems from Gold’s theory of an abiogenic source of petroleum involving the inclusion of abundant hydrocarbons in the core and mantle during the early accretionary phase of the Earth’s formation. Merits of the abiogenic petroleum theory aside, onshore methane gas bursts in developed areas seem an unlikely explanation for booming sounds in the absence of eyewitness accounts or tell-tale signs such as craters, mud volcanoes, or maars. Active volcanoes commonly produce booming sounds associated with the explosive venting of volcanic gasses and eruptions (e.g., Johnson and Lees 2000). Of course active volcanoes are generally highly visible, noisy neighbors, so the source of any associated booming sounds is likely to be quite evident to the local population. Gold, T., and S. Sorter (1979). Brontides: Natural explosive noises. Science 204, 371–375. Johnson, J. B., and J. M. Lees (2000). Plugs and chugs—seismic and acoustic observations of degassing explosions at Karymsky, Russia, and Sangay, Ecuador. Journal of Volcanology and Geothermal Research101, 67–82. Under proper circumstances, sand dunes are capable of producing a variety of low-level whispering, whistling, singing, humming, or squeaking sounds, and less commonly, loud booming sounds (Sholtz et al. 1997; Lindsay et al. 1996), as shown in the video of this post. The so-called “booming sands” appear to be limited to large sand dunes with steep leeward faces in arid climates. The booming sounds produced by such dunes can grow to levels comparable to rumbling thunder and, under the right conditions, can be heard to distances of 10 km with durations as long as 15 minutes, and they can couple into seismic waves that produce locally perceptible shaking (Sholtz et al. 1997). 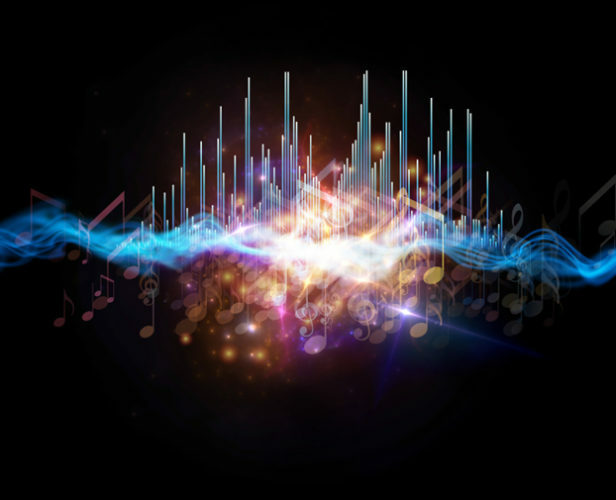 To produce booming sounds evidently requires very low humidity and loosely packed, quasispherical sand grains with high surface smoothness, although details of the process by which the acoustic emissions are produced remain poorly understood. In their global survey, Lindsay et al. (1996) do not identify the Carolina coast as an area known for booming sands. Lindsay, J. F., D. R. Criswell, T. L. Criswell, and B. S. Criswell (1976). Sound-producing dune and beach sands.Geological Society of America Bulletin 87, 463–473. Sholtz, P., M. Bretz, and F. Nori (1997). Sound-producing sand avalanches. Contemporary Physics 38 (5), 329–342. Meteoroids penetrating the upper atmosphere become meteors, which can produce sonic booms of varying intensity. Here some examples. Because of the time required for a sonic shock wave to reach the Earth’s surface from the upper atmosphere, the visible trace of the meteor has usually vanished before its sonic boom is heard. Thus, particularly during daylight hours, the source of the boom may go unnoticed. Of course in the less common case of a meteoroid that penetrates the atmosphere and strikes the Earth (a meteorite), the link between the shock wave and “fireball” can be rather obvious if not dramatic. Strange Sounds: Weird Noises Associated With Meteorite Falls – A Link to the Strange Sounds in the Sky?